One of the downsides of live blogging an event is that in the breaks you end up being quite busy. The wifi isn't great here so I had to try to rectify that and secure a stronger connection (which I have), grab a coffee, upload the previous blog and share it on social media, talk to a few people and somehow get to the toilet and back within 15 minutes. It's quite hectic and I didn't manage all of this in the first break. I'll let you decide which one I didn't manage. 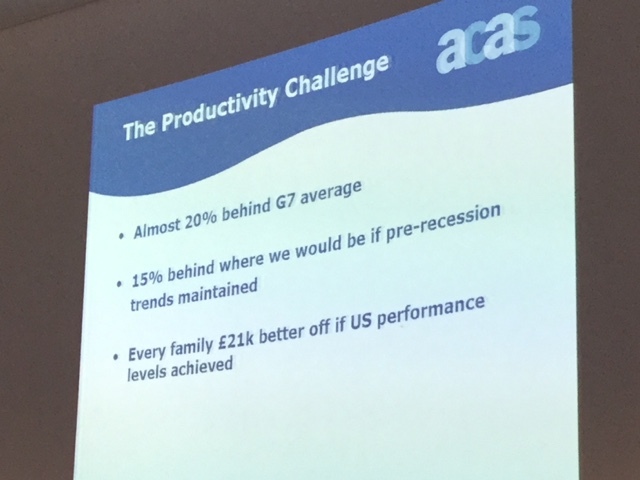 So we are back in the room and kicking us off in the pre lunch session is Sir Brendan Barber, Chair of ACAS, on building productivity in the UK. Brendan started by talking about the sheer volume of work that ACAS does, which all in all boil down to resolving issues that affect people's productivity in the workplace. ACAS have developed seven levers for building productivity. First, work organisation. This is about simplicity of processes including decision making. Brendan gave an example of a decision needing 31 different levels to have an input and contribute to the eventual decision as being unhelpful. He also talked about the way that physical environments can impact on productivity as well as the design of work. Second, ther skills of line managers. 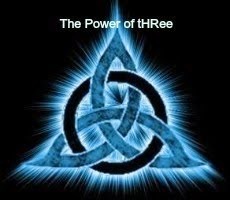 This is not a new thing but seems to be one that isn't being easily solved or going away. Just last week I've seen an example of where some business owners, successful in many aspects, have little or no people management skills and how that is affecting the productivity of one of the very few employees they have. It startled me to see the relationship between cause and effect in that example, but it's obviously a widespread issue still. Third, managing conflict effectively. Obviously this was a bit of a plug for ACAS and the work that they do, but it's a relevant point, but I've been talking about building line managers skills in doing this for some time, so it's good to see it up here. Fourth, rights and responsibilities. Brendan here referenced some of Peter Cheese's earlier speech talking about the changing way people work and the uncertainties that inevitably develop from this. Peter and Brendan both called for businesses to better understand the ways in which people behave in organisations. Fifth, fairness. Brendan rattled through this one as it ought to be self explanatory, but perceptions of fairness do differ and I think this one often needs reconciling at an individual level. Sixth, employee voice. This has been covered extensively in other views of employee engagement so I'll not cover what it means here. Finally, high trust. This runs through all of the previous six, and if the trust is there between employee and employer then they have a good chance of achieving success with the first six levers. Brendan nicely acknowledged the point that I was thinking all the way through this, that this isn't new or indeed rocket science. But he referenced the concept of marginal gains as espoused by Sir Dave Brailsford in cycling, and related this to the seven levers by asking organisations to look where marginal gains can be made in any one of these levers in order to achieve overall success in building productivity. I guess the point is that small changes can often be enough. At that point Tim Scott took over for a bit of a change of energy and focus, talking about the value of social media to HR. I have to be careful here because Tim is a fellow blogger and a genuinely nice person! Tim is talking about the virtues of social media and, of course, plugging his and Gem Reucrofts' book on the subject. I've heard Tim talk about such subjects before but, having followed Peter Cheese and Brendan Barber, I wondered how he could build on the concepts outlined by both and relate them to the development of social media at work. Tim gave us some relevant statistics that showed how the vast majority of working age adults now access the Internet regularly during the working day, and how those entering the UK workforce increasingly use it for almost everything so it's a growing trend for organisations to get hold of and use. It's the reality. Tim told us some of his own story which, in quite a few aspects, mirrored my own. He gave a good account of why HR professionals should be using Twitter and social media. He talked about the value of connecting, sharing, learning and building a personal brand through social media, specifically Twitter. Again, I can relate directly to this, though I've come to it a little later than Tim did. His advice was to be yourself, dive in and to share stuff. These are all good pieces of advice. I enjoyed Tim's talk. It was humble, warm and humorous, and very real. And he had a good exercise to illustrate the value of sharing and talking to people. It's clear that social media is something that almost all workers will be doing in the future, and that organisations need to understand and use it to communicate with and to some degree manage their staff. Some very relevant and practical examples helped to underline Tim's points about incorporating social media into HR practices and, I assume, these are detailed more in his book. Tim suggested we should not worry about having to control social media, but worry about not understanding it. Not understanding social media is tantamount to not understanding our workers, and here is the link to both Peter and Brendan's earlier talk. Letting people be themselves on social media may contribute to people's happiness. It might also build trust and give employees a voice.